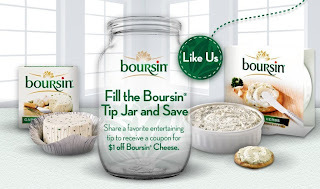 Share a Tip & Get a $1/1 Boursin Cheese Coupon! Yum! Head over to the Boursin Cheese Facebook page and share one of your favorite entertaining or recipe tips to receive a $1 off coupon! Click here to share and receive!